PYT Cheesesteak Pretzel Roll Burger | DidjaEat? Being from Philly, I love many local foods but 2 of them are Cheesesteaks and Pretzels. When you combine the two of them, the result is….fantasticness! 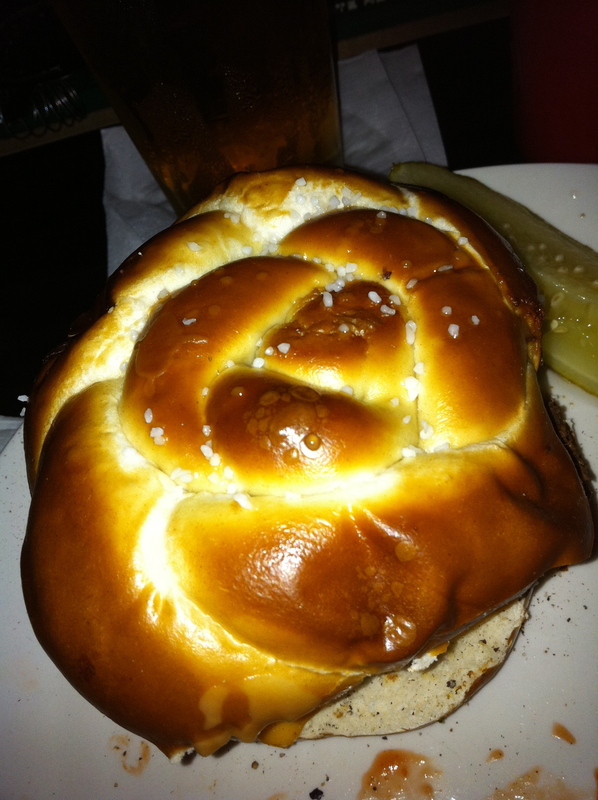 I give you…the Cheesesteak Pretzel Roll Burger at PYT! A burger, with cheesesteak, cheese, onions on a specially made by Philly Pretzel Factory Pretzel bun. Holy mother of god, this thing is delicious. I had dropped by PYT to drop off some pierogies (disclaimer: I make an exclusive pierogie for them: the Bacon Cheeseburger. They also sell my Pumpkin Cheesecake pierogie!) with my friend Mary Kate from Ida Mae’s Bruncherie, a breakfast and lunch place in Fishtown. So. Good. You go now. 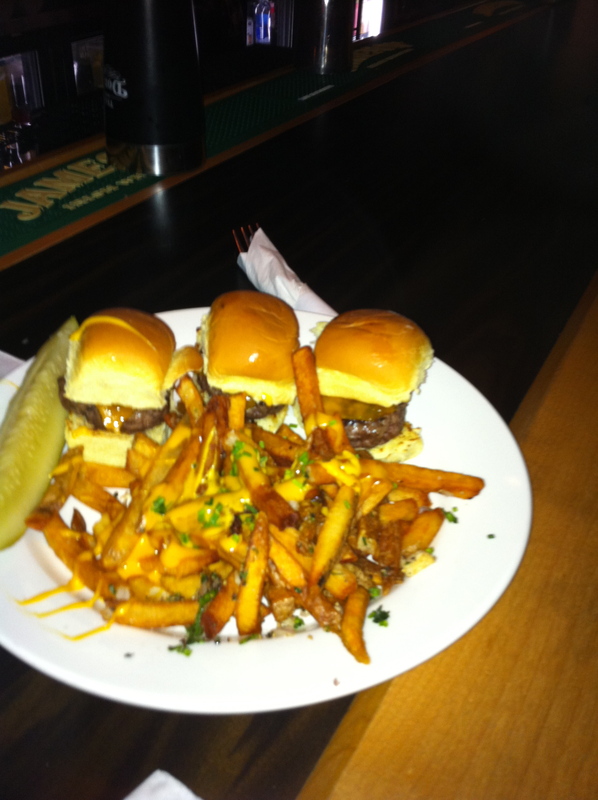 Mary Kate also got an order of these teeny, perfectly cooked little sliders with cheese fries! And! 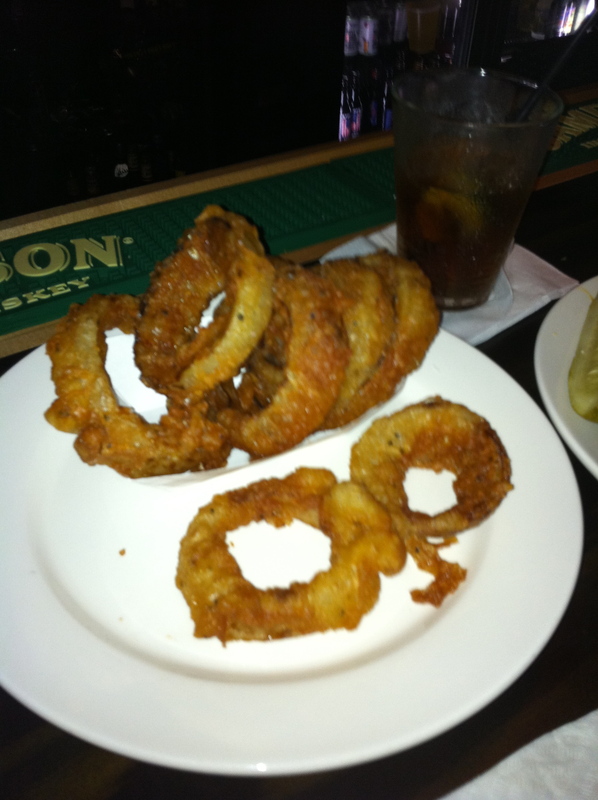 we split an order of thier batter dipped onion rings. Ooo yeah! They used black pepper either in the batter or right when they come out. I don’t know which, but we were stabbing each other to get the last one. I hate Onion rings that, when you bite them, the onion comes right out. These do not! Deeeeeee-licious!! The only thing I can think of to change is to maybe have some kinda dipping sauce. As you can probably tell, I am working my way thru their menu. It is a bit of work, but delicious work nonetheless! 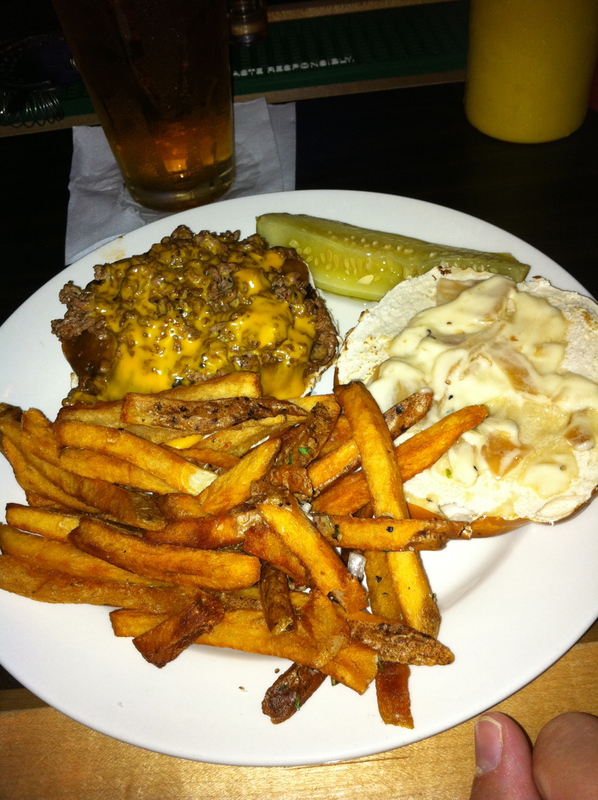 Posted on October 31, 2010, in bar food, burgers, restaurants and tagged cheesesteak burger, philly pretzel factory, pyt philly, soft pretzel roll. Bookmark the permalink. 1 Comment. I am a self-proclaimed foodie who had the pleasure of devouring this burger this past weekend. I am huge fan of pretzels, cheese steaks not so much, but this pair was simply orgasmic, lol. My taste buds exploded with joy when I took my first bite. I was mad that my full stomach refused to let me finish it. I recommend this burger to any Philly cheese steak fan. You won’t be disappointed.